Sometimes children have difficulty thinking what to write about. You can help them by providing homeschool writing prompts. Below you will find interesting words that will help your child start his story. There are characters, character traits, settings, and different plots. Have your child pick a word from each category. Then have him write a story using the words. The story can be serious or funny. Before you begin be sure that your child knows the meaning of the words. All stories have a main character. Here is a list of animals, reptiles, birds, insects, and people. There should be at least one character here that has a story that needs to be told. The next step in writing a good story is to give your character a trait. Is he sad, funny, or smart? Here is a list of character traits. Each story takes place somewhere. 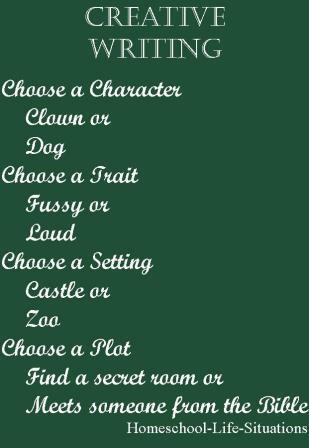 Here is a list of homeschooling writing prompts that deal with the setting. In every good story there is a problem that needs to be solved. Or there is a conflict. This is the plot. Here are some plot ideas. Next have your child use the homeschool writing prompts to write a story. He will need to add details and sequence events. A daring explorer finds gold in the jungle is not very exciting. You need to add some details. One way to complete the story is to ask who, what, where, when, why, and how. Your readers would want to know what the explorer did that was daring. They would also want some details about how he found the gold. We know that the gold was found in the jungle but where. Was the gold found in a cave that was guarded by natives? Continue thinking about details and the sequence of events until you have an exciting story. Homeschool writing prompts are a tool to help your child write stories.